From daily experience, spending time waiting to have dinner outside of restaurants is a waste of time. 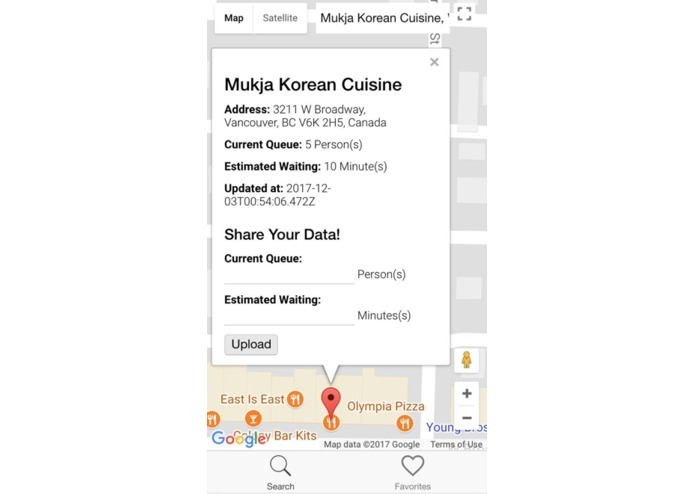 If we can access real-time queue lengths and estimated waiting time, we can plan beforehand and select the restaurant with shortest waiting time. Therefore, we are trying to build a mobile app that keeps track of real-time queue data contributed by app users. 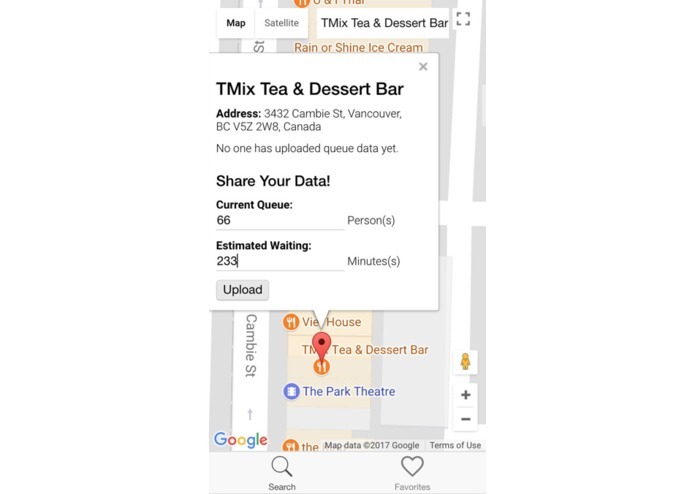 Search and locate restaurants with Google Maps SDK. Fetch and visualize data from the SQLite database. Support data uploading from client sides. Difficulties in integrating Google Maps SDK into Ionic Framework. Lack of time -- only 12 hours compared to normal 24-hour and 36-hour hackathons! Our team only consists of two first-year students (Science + Arts). Fully-functional API for fetch & upload data. 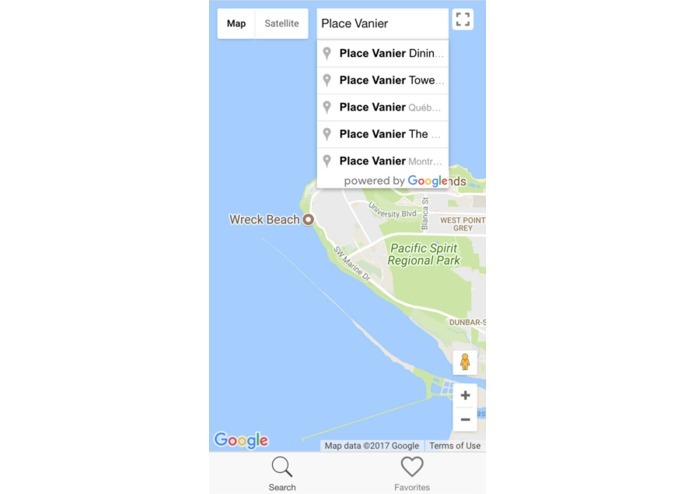 Mobile app prototyping with Ionic Framework and Google Maps SDK integrated. Push notifications for data changes. Dynamically compute queue data with algorithms and (possibly) machine learning. Utilize image recognition to compute queue length and estimate waiting time with street cameras. Authenticate users with QR code. Copyright © Yuchong Pan, Feiyi Wang. All Rights Reserved. 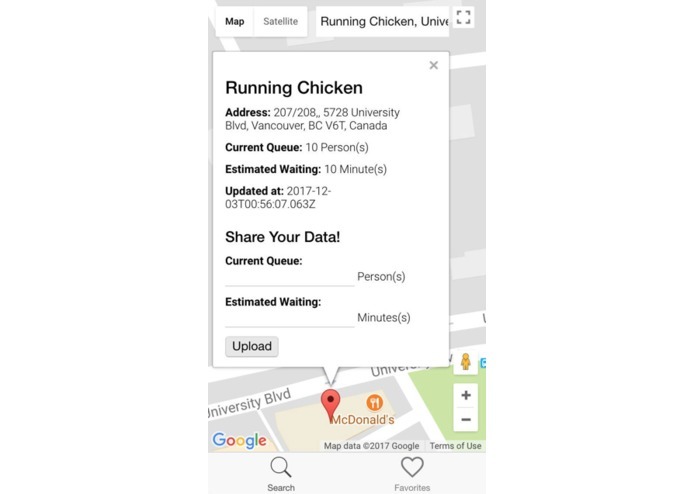 This project is created at UBC Local Hack Day 2017.